The Habsburgs (Hapsburg) extended their wealth and dominion by marrying heiresses in different regions. They operated a feudal system and a servitude system, ruled by Counts and Countesses, Dukes and Duchesses, and by Kings and Queens. Also, when you can trace your linage back 25 generations, and your ancestors have statutes in city squares, creeps and basilicas, portraits in museums and castles and government buildings, and when their family trees, stories, history and influences are written in numerous texts then you should know that it had a serious present during their generations and had power and importance and likely great wealth; the combination of which had to flow some into the modern generations. But these words do not sufficiently paint the pictures of a organized force that is greatly responsible for much of the beauty in the Vatican and chapels and architecture throughout parts of Europe and more so for the structure of countries and the languages which are spoken on continents – Spanish dominating South and Central America – and by the powers above, English taking North America. Their kings and dukes financed wars and lands and married into the Bankers that financed them, giving both more power and wealth. Regardless of love, many for family and or wealth would marry first and second cousins, uncles, nieces and nephews and half-sisters and half-brothers. They often named their children for their great rulers. And when it came to wars and wealth, certain kings could pledge provinces and masses of land, such as Venezuela, as collateral for their debts; then as a king, could default on their debts and leave them to their children and for their countrymen to pay back. And until America printed money it paid by debts to its financiers of wars by tariffs and when that was not enough created a tax system to pay the Central Bankers which became the electronic Federal Reserve System. As to the Hapsburg connections to secret societies, for the most part it was unneeded, they had the power for centuries until World War I, to do in the open just about what ever they wanted, whether Queen bloody Mary burned heretics at the stake alive for being unrelenting or unrecanting Protestants or whether a King wanted mistresses or wars. However, it is true though some of their daughters were great supporters of the Church and lovers of God and builders of Chapels and Convents and Monasteries; they also had their non-religious and even followers of the occult. For example childless King Rudolf II, 11th generation from his namesake, neutral towards Catholic, Protestant and Jews, yet very positive towards the occult. He also experimented with alchemy in more ways than seeking medical breakthroughs. Rudolf’s known family goes back over 400 years before his birth, over 1200 years ago to Court Hugh II of Tours, France who was born c.775AD. These are his generations: Hugh, 2g Eberhard II (c.802-881); 3g Eberhard III (c.865-898); 4g Hugo V (c.895-940); 5g Guntram ‘the Rich,’ 6g Lanzelin von Altenburg, Switzerland (c.942-981); (his cousin; Hedwig (Edith) von Nordgau was wife of Siegfried I, Count of Luxembourg; 7g Radbot von Klettgau, Switzerland (c.970-1027); 8g Werner I, Graf von Habsburg (c.1030-1096) brother of Count Otto II of Habsburg; 9g Otto II, (c.?-1111) Graf von Habsburg brother of Albrecht II of Habsburg, Switzerland; 10g Werner II (c.?-1167); 11g Albert III the Rich (c.?-1199) brother of Bishop Otto II; 12g Rudolph II, Count of Habsburg (c.?-1232); 13g Count Albert IV (1188-1239). Note: through Hugh V: 19g Adolf von Nassau would become a King of Germany (c.1255-1298). Rudolf came from 14 generations of nobility and wealth. 9c1g Judith of Habsburg ma. King Wenceslaus II of Bohemia; and was mother to: king Wenceslaus III of Bohemia, Poland and Hungary; of queen Anne and queen Elisabeth of Bohemia. From 1348 to 1350, the Black Death plague killed over a quarter of Europe’s people. 1351-1386 He married Viridis Visconti of Milan and they had 6 children. 1377-1424 Ernest married Margaret who died without giving children; then he married Cymburgis Grandniece of King Wladyslaw of Poland. One married a Count and one was Bishop of Utrecht. 1415-1493 Frederick III was crowned by the Pope in Rome. He was the first Habsburg Emperor and one of the longest reigning monarchs ruling more than 53 years. He was also King of Germany. Frederick reunited Habsburg lands in Austria. Though he long, he and Eleanor, daughter of the King Edward of Portugal, only had 2 children: 7g Duchess Kunigunde and Maximilian. 1459-1519 Emperor and King Maximilian expanded the House of Habsburg through war and his marriage in 1477 to Mary of Burgundy. She died young after having (8g) Philip I and Margaret. He would marry again, but have no other children. 1476-1506 Philip was the first Habsburg King of Castile. At age 3 he inherited lands in Belgium, France, Germany, Luxemburg and the Netherlands. He married Queen Joanna of Castile. He died before his father, and his son became (9g) Emperor Charles V. He also united and gained Habsburg lands. Though he died at age 28; he and Joanna had six children; namely Charles & Ferdinand. Their daughter Catherine of Austria ma. King John III of Portugal. Francesco I (1541-1587) de’ Medici, Grand Duke of Tuscany; she is buried in the (Medici) Basilica of San Lorenzo, Florence. Ferdinand I (son of John I of Castile) died in 1416. His son John II of Aragon (1398-1479) was the father of Ferdinand II (1452-1516) who married Isabella I of Castile and together they received the kingdom of Spain and later sent Christopher Columbus to the Americas. Ferdinand and Isabella’s daughter Joanna was married to Maximilian I and Mary’s son Philip and had Charles V and Ferdinand I (Emperor 1556-1564). Philip, King of Spain, Portugal, Naples and Sicily, ma. his cousin Maria (d. of King John III of Portugal) but died at 17. Philip, during his ma. to Queen Mary I, was King of England & Ireland. He was Duke of Milan and lord of part of the Netherlands; his wife ‘Bloody’ Mary, daughter of King Henry VIII, had over 280 religious protesters burned at the stake. She died at 42 w/o a child Elisabeth of Valois (d. of King Henry II of France and Catherine de’ Medici) bore 2 children; 2c11g Catherine Michelle of Spain 1567-1597. Anna of Austria, his niece (of Ferdinand) gave him 3 children; only 1 survived infancy: 3c11g Philip III of Spain. Charles, third son of Ferd. ma. his niece Maria Anna of Bavaria (d. of Albert V of Munich; grandson of Emperor Frederick III). She bore 15 children; 1c11g Anne married King Sigismund III of Poland and King of Sweden – she bored King Wladyslaw IV. c611g King Ferdinand II; c8 Gregoria Maximiliana died at 16, but her godfather was Pope Gregory XIII (1502-1585); c11 Margaret ma. King Philip III of Spain. c13 Constance ma. King Sigismund III (widower of her sister Anne). c14 married Cosimo II de’ Medici of Grand Duke of Tuscany (he was a patron of Galileo). c15 Charles was a Bishop & Grandmaster of Teutonic Knights. King: Bohemia, Germany, Hungary, Croatia, H Roman Emperor. Helped overcome Catholic/Lutheran conflicts, yet ongoing Ottoman-Habsburg wars and conflicts with his Spanish cousins. 1c13g King Ferdinand IV (died age 20 no children; 2c Queen Mariana of Austria (ma. Uncle Philip IV of Spain); 5c Leopold I.
had Karl Josef, Grand Master of Teutonic Knights (died at 14). 2c Queen Eleonora Maria (ma. Michael Wisniowiecki of Poland). 1661-1700 Son of Philip IV; King of Spain, though Charles married twice, he had no children and was the last Habsburg ruler of Spain. Charles’ realm was vast: Spain’s overseas empire from the Americas to the Spanish East Indies and he still had control over part of Habsburg lands in Netherlands. He was known as ‘el Hechizado (the Bewitched)’ because of his physical and emotional disabilities. In his will he named his teenaged grand-nephew, Philip of Anjou, grandson of his half-sister Maria Theresa (first wife of King Louis XIV of France). 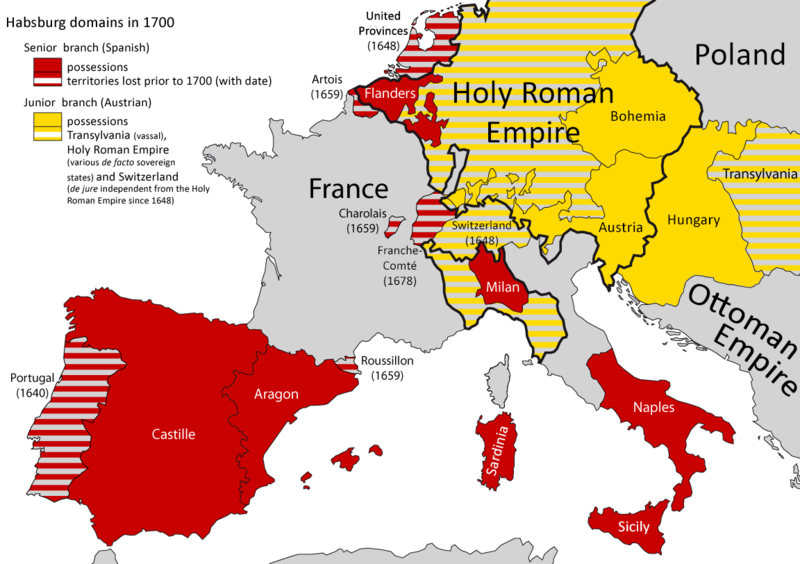 This triggered the War of the Spanish Succession (1701-1714) between Spain loyal to Charles and their allies, the Holy Roman Empire, Great Britain, Portugal, etc. vs. Spain loyal to Philip and their allies, France, Bavaria, Castile, Naples and Sicily. Treaties (T. of Utrecht): Spain cedes Spanish Netherlands, Naples, Duchy of Milan, and Sardinia to Austrian Habsburgs and France and Spain give Newfoundland and some small islands to Britain; and all recognized Philip (1683-1746) as Philip V, King of Spain (1700-1724). d. of Ferd. II She married King Wladyslaw IV Vasa of Polish-Lithuania. Wladyslaw Vasa was of the House of Vasa – nobility of Sweden back to the 14th century. She was Wladyslaw’s first wife and gave 2 children that did not survive infancy. Philip of Anjou (1683-1746) Philip V, King of Spain (1700-1724). Otto (1912–2011), Adelheid (1914–1971), Robert (1915–1996), Felix (1916–2011) and Karl (1918–2007) were all born while the monarchy still existed. Rudolf (1919–2010) and Charlotte (1921–1989) were born in exile, while Elisabeth (1922–1993) was born after her father’s death. Hope to explain decline in power and share of power transferring to Bourbon Spain, the Lorraines which also married into the Habsburgs (Medici) and after War World I and especially WWII, power transferring from kings to bankers and a One World Government, ran through little things like the UN, Stock Markets and Central Banks; and their headquarters of decisions being annual secret meetings and backroom texts and talks. Likely will start this on Page 3 and maybe later filling in some of the above 19th and 20th century right column.